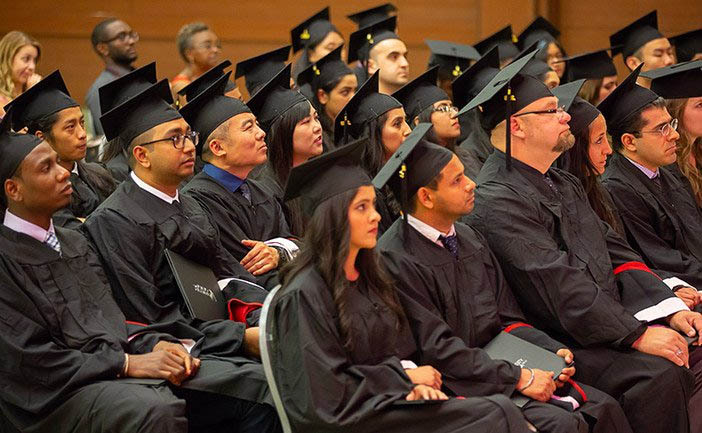 Fifty-two students graduated at University Canada West's Convocation 2018. The ceremony was held on July 13 at the Italian Cultural Centre in Vancouver. It was attended by the students, friends, family, faculty and staff. It was also live streamed on Facebook for the first time. “I have confidence in your education and your values, that you will be doing the right thing,” said Dr. Arthur Coren, UCW president and Vice-Chancellor during his address. He talked about the need for the graduates to make positive change in their lives and the lives of the people around them. The majority of students graduated from the Master of Business Administration program, while others graduated with Bachelor of Commerce and Bachelor of Arts in Business Communication degrees. The 2018 graduating class had an international flavour. Ten grads are from Canada, seven from Africa, 14 from India, four from the Middle East, nine from the Far East, four from Europe, and two each from Central and South America. Loujeine Kamoun is University Canada West’s Valedictorian for 2018. She earned her MBA with a 4.0 cumulative grade point average. She started her academic journey at UCW in the MBA Foundation program in the Fall of 2015. “I am extremely honoured to have been chosen to be the voice of my classmates and friends,” said Loujeine in her Valedictory Address. She also was named the recipient of the Medal for Academic Excellence in the MBA program and was one of only three students to Graduate with Distinction this year. Loujeine grew up in Kuwait, has studied in France and earned a bachelor’s degree in fine arts in England. Vininder Pal Singh was the recipient of the Medal for Academic Excellence in the Bachelor of Commerce program. He lives in Markham Ontario and has been pursuing a Bachelor of Commerce degree online at UCW since August of 2012. He was unable to attend the ceremony due to work commitments. He also Graduated with Distinction. Keren Morales was the third student to Graduate with Distinction for 2018. She completed the MBA program online from her home in Ontario. Family and friends travelled from all over the world to share in the special day with the graduates. “Convocation is the celebration of our students’ commitment, dedication and perseverance,” Dr. Coren said. University Canada West is a business focused university in the heart of downtown Vancouver, British Columbia. UCW offers both online and on-campus Bachelor of Commerce, Bachelor of Arts in Business Communication, Associate of Arts and MBA programs. For more information email info@ucanwest.ca.